■ Height >10 m; culm diameter >5 cm; clumper; habit erect, slightly bending, branching throughout, thorny. 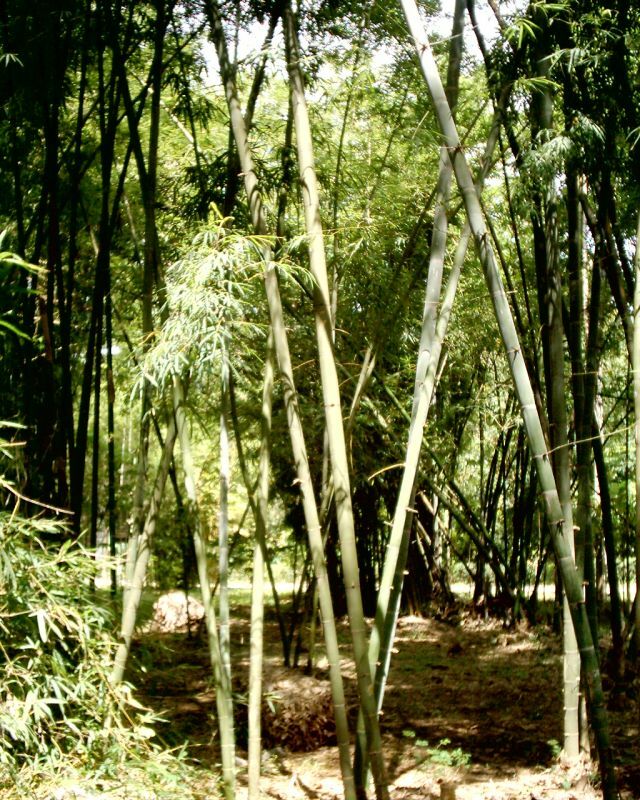 ■ A bamboo widespread in South-East Asia. ■ Easy growing, moisture-retentive soil, full sun. ■ Shoots for diet; culms for construction; solitary or group for tall visual screen, windbreak, or impenetrable barrier along boundaries. ► [173, 210, 221, 224, 226] (BS)! ■ Height 10? m; culm diameter 8? cm; clumper; habit erect, slightly bending, branching throughout. ■ Shoots delicious, emerging late, planted for commercial shoot production and biomass production. ■ Identification not yet verified. 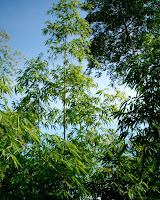 ■ Height 18 m; culm diameter 15 cm; dense clumper; habit tall erect, slightly bending, branching throughout. ■ A thorny giant, frequently found wild and planted. An old clump forms an impenetrable thicket, making harvest difficult. ■ Planted for shoot and culm production. Shoots delicious, culms used for many construction purposes. Plants for windbreak and barrier along boundaries. ■ Height 8-10 m; culm diameter 4-5 cm; clumper; habit erect, slightly bending, branching throughout. 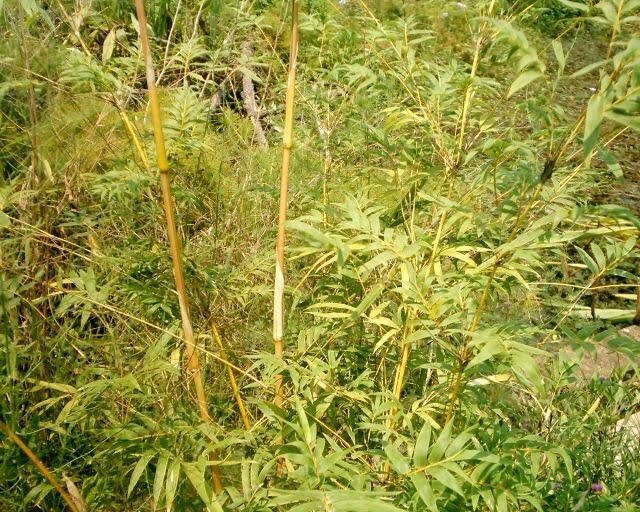 ■ A bamboo bushy and with small foliage leaves when young. Lower branches rarely with short thorns. Culms thick-walled or solid. ■ Easy growing, moisture-retentive soil, full sun, tolerates some drought and light shade. ■ Shoots delicious, can be eaten raw. Plants for low to medium-sized natural hedge, visual screen, solitary or group planting. Culms for tools and light construction. ►  [203, 268] (BS) (BW)! 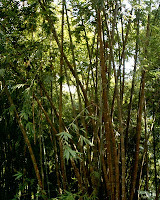 ■ Height 3-4 m; culm diameter 1.5-2.5 cm; dense clumper; habit erect, bending, branching throughout. 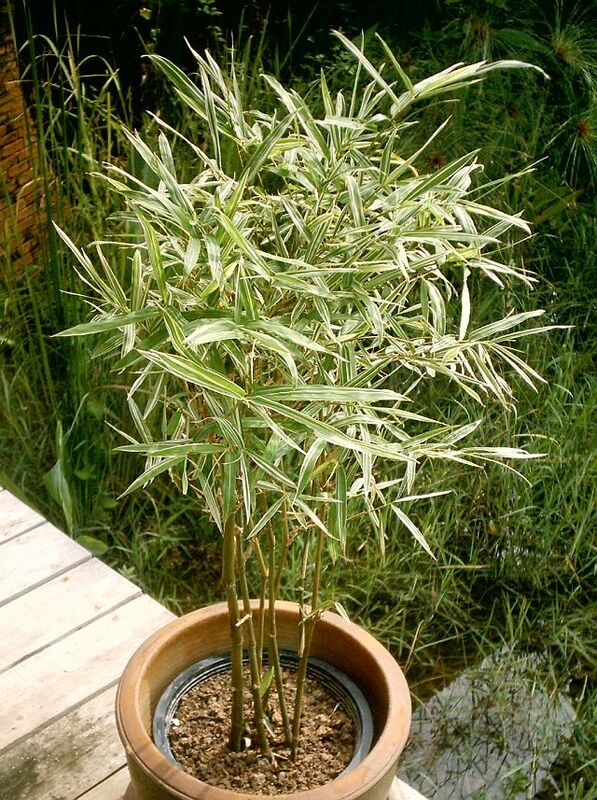 ■ A low bamboo with variegated small leaves for every garden. May occasionally revert to the wild form with larger green leaf foliage and taller stems. ■ Easy growing, moisture-retentive soil, full sun, tolerates light or partial shade. ■ For low or medium-sized trimmed hedge, or solitary. Suitable as a container plant. ■ Height 8-12(15?) m; culm diameter 5-8(10?) cm; clumper; habit straight erect, slightly bending, no low branching. ■ An outstanding ornamental bamboo. 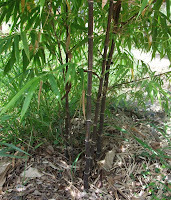 Culms shading to nearly black with maturity, occasionally with a narrow green stripe. ■ Easy growing, moist soil, full sun or light shade, sheltered site, not exposed to strong winds. ■ Solitary or group. Culms used for furniture making and light-weight construction. 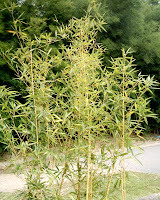 ■ Height 3.5-5 m; culm diameter 1-2 cm; dense clumper; habit erect, strongly bending or arching. 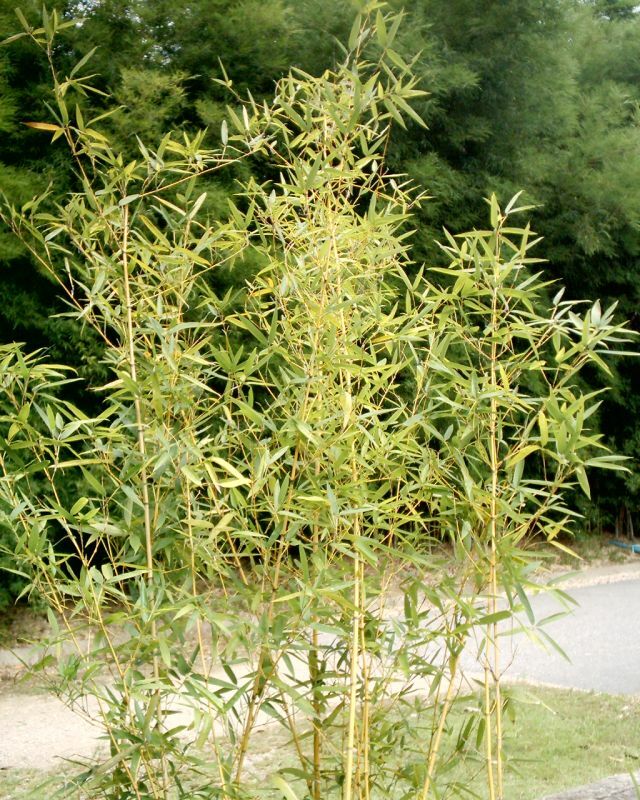 ■ A widely cultivated low bamboo for every garden. Stems and foliage leaves green; stems turning to orange-yellow in full sun but remain green in shade. ■ Easy growing, moisture-retentive soil, full sun or light shade, tolerates deep shade. ■ For low to medium-sized (trimmed) hedge, low visual screen, or solitary. Does well as a container plant. 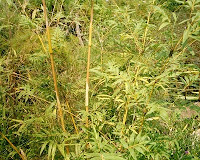 ■ Height 3.5-5(8.5) m; culm diameter 1-1.5(3.5) cm; dense clumper; habit erect, slightly bending. 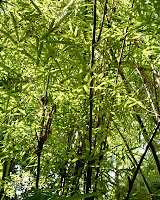 ■ A low feature bamboo for every garden. Green-striped pink shoots become yellow or orange-yellow culms with random green stripes of variable width. Leaves are green and of normal size. ■ Easy growing, moisture-retentive soil, full or partial sun, light or dense shade. ■ For low to medium-sized dense hedge, low visual screen, or solitary. Does well as a container plant. ■ Height 2(3.5?) m; culm diameter 1-1.5 cm; dense clumper; habit erect, V-shaped, small foliage leaves. ■ Culms yellow with green stripes. 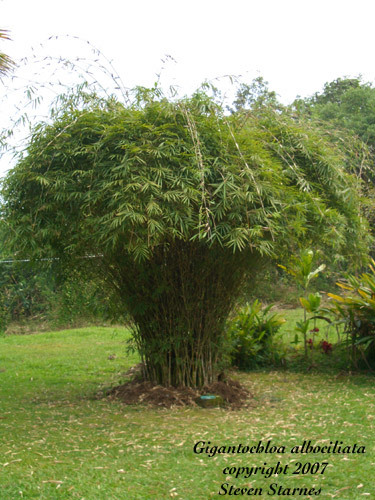 A very low ornamental bamboo with fern-like foliage leaves, might revert to larger foliage. ■ Slow growing, moisture-retentive soil, best in light shade. Does well as a container plant. ■ Best as a low hedge, solitary or container plant. 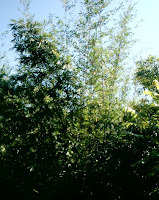 ■ Height >10 m; culm diameter 5 cm; dense clumper; habit erect, slightly bending, no low branching. 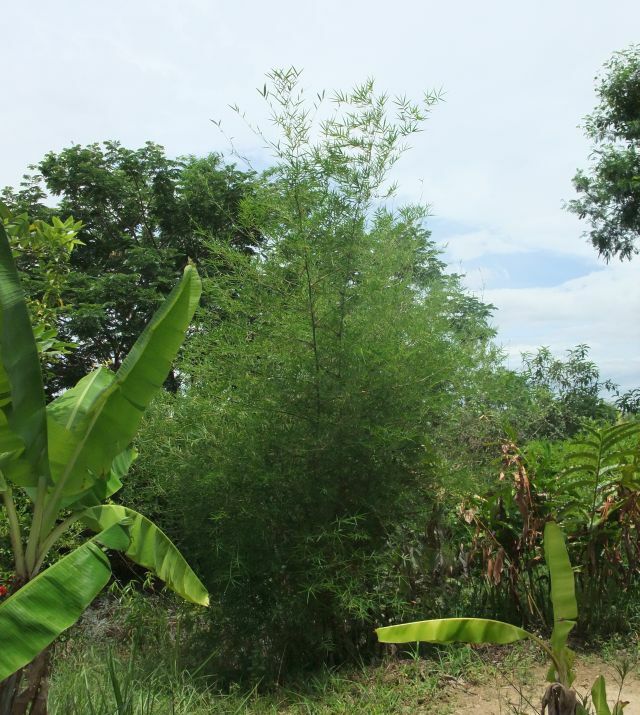 ■ A highly appreciated ornamental bamboo in Thailand, new shoots cinnamon-colored, foliage leaves small and narrow, dark green. 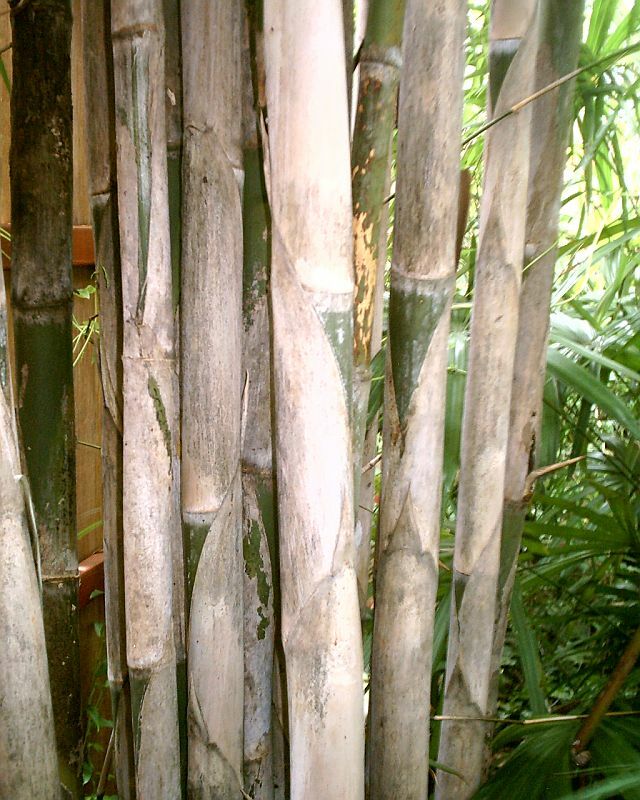 Culms straight and dark green, may fade to whitish when old, thick-walled with basal part nearly solid. ■ Easy growing, moisture-retentive soil, full sun, tolerates light shade. ■ For medium to tall-sized visual screen, solitary or group, also suitable for tall trimmed hedge. Shoots of good taste. Culms used for light-weight constructions and tools. ■ Identification not yet verified. 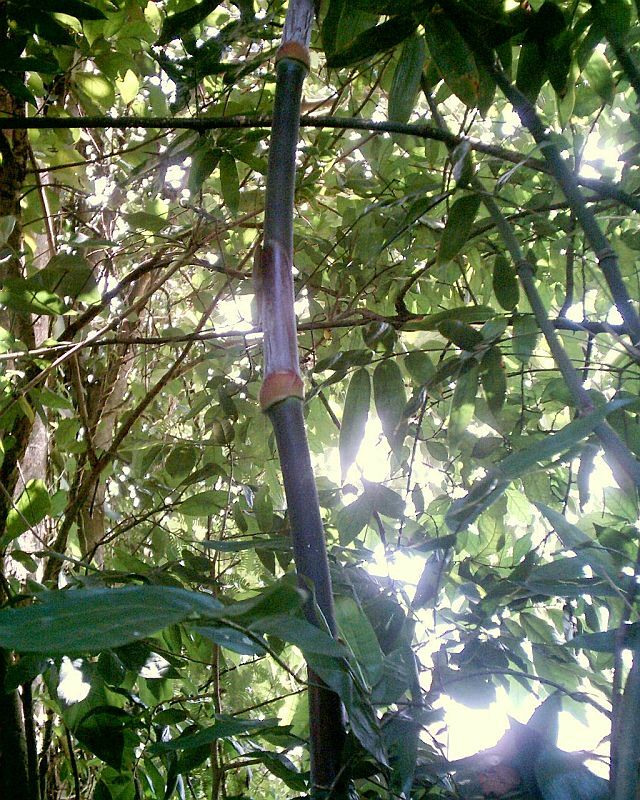 Even the genus assignment of this bamboo is still in question. Sometimes found misnamed as "Bambusa multiplex". 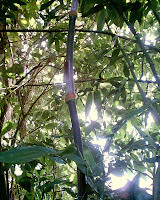 Phai liang is also different from what is named and pictured as "Bambusa sp. 'Nana'" in bambooweb.info. ► [001-1, 241, 266] (BS1) (BS2)! 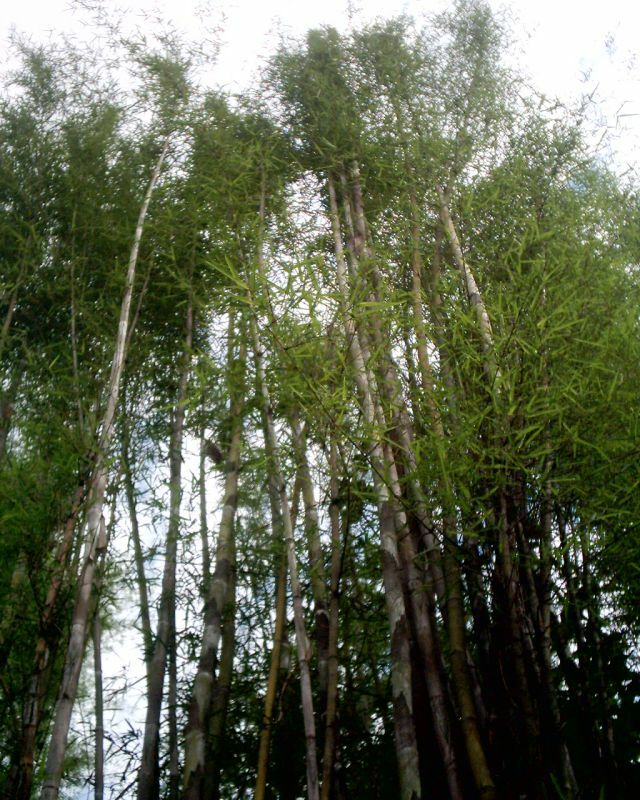 ■ Height 5-10 m; culm diameter 4-5 cm; dense clumper; habit erect, slightly bending, no low branching. 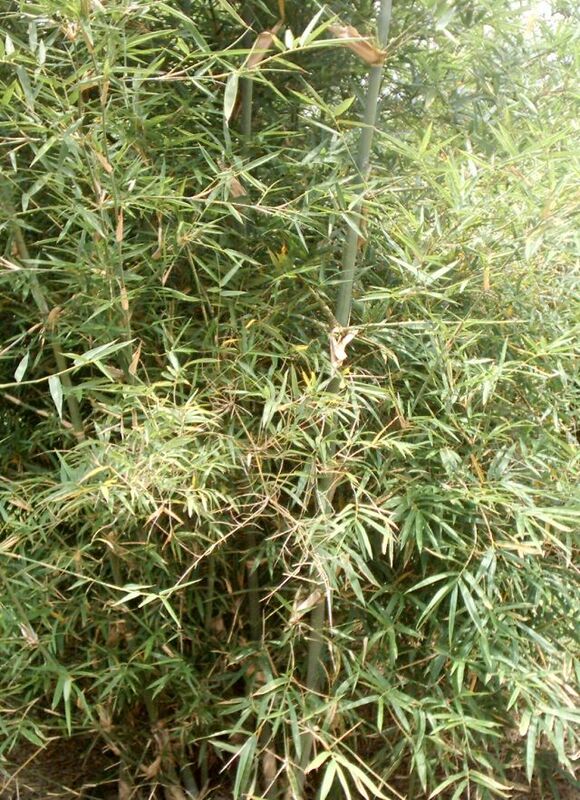 ■ A bamboo similar to phai liang, but color of foliage leaves and young shoots light green. 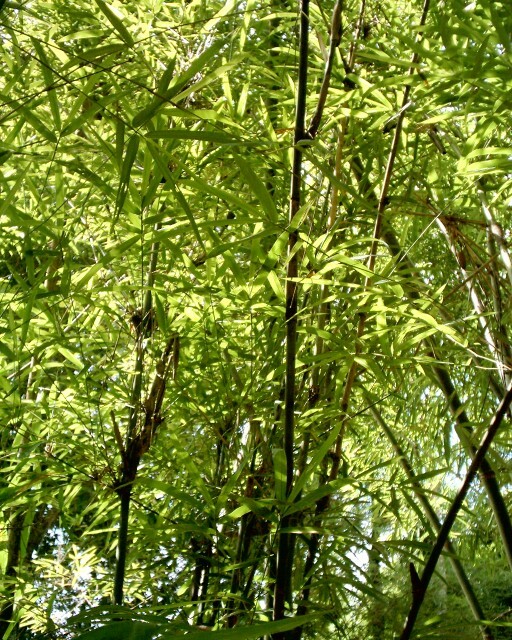 ■ A bamboo of highly ornamental value for medium to tall-sized visual screen, solitary or group, and possibly suitable for tall trimmed hedge. Shoots delicious. ■ Identification not yet verified. 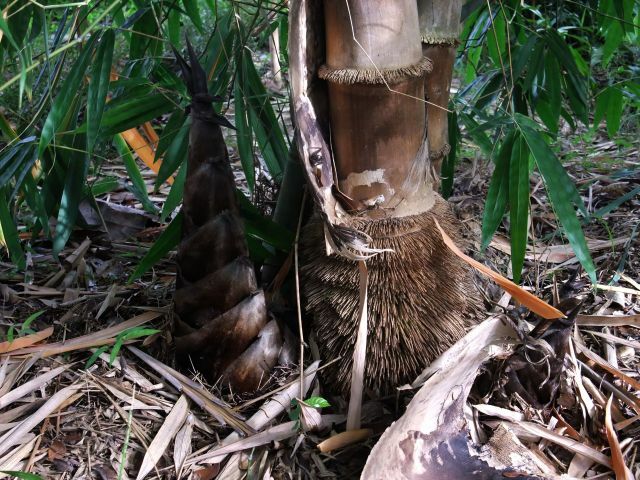 This bamboo very likely belongs to the same species as phai liang and was selected for its better taste of shoots. ► [001-2, 001-3, 263] [189B] (BS)! ■ Height 10 m; culm diameter 7-10 cm; clumper; habit upright to V-shaped, slightly bending above, branching throughout, short branches. ■ A bamboo with appealing shoot and culm color. Vivid green culms may turn into golden yellow in strong sunlight. ■ Easy and fast growing, moisture-retentive soil, full sun. ■ Shoots delicious, in Thailand chiefly planted for shoot production. ■ Height 10-20 m; culm diameter 5-12 cm; clumper; habit erect, slightly bending, branching throughout. ■ Widely distributed. 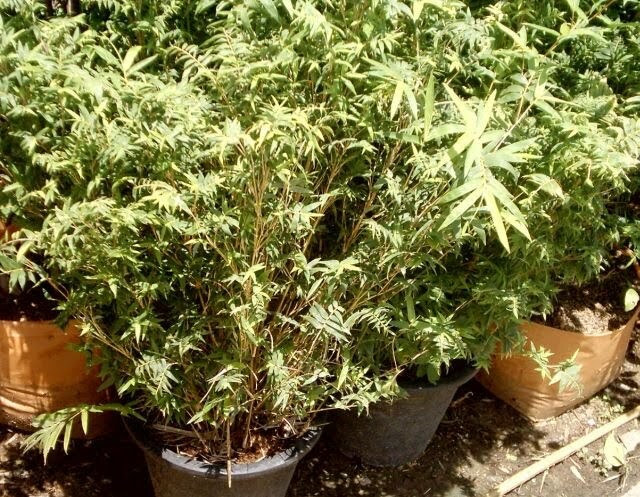 Easy and fast growing, moist or moisture-retentive soil, best in full sun. 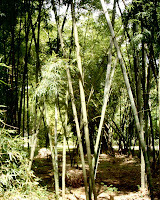 ■ Culms for construction and scaffolding; leaves for forage; plants for tall visual screen. Shoots usually not eaten. ■ Height 10-15(20?) m; culm diameter 5-12 cm; clumper; habit erect, slightly bending, branching throughout. 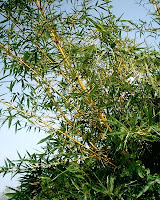 ■ A widely planted and much appreciated ornamental bamboo. Culms bright yellow, randomly striped with dark green of varying width. ■ Easy and fast growing, moist or moisture-retentive soil, best in full sun, but does well in light shade, too. ■ For tall visual screen, or solitary ornamental. Culms good for temporary light-weight constructions. Shoots edible (with bitter taste) which are esteemed by Vietnamese rather than Thai people. ► [187, 209] (BS) (BW)! ■ Height 4-5(8?) m; culm diameter 10-12 cm; clumper; habit erect, slightly bending, branching throughout. ■ A widely planted and much appreciated ornamental as for its shortened, inflated shape of internodes on the lower part of culms. Usually, young branches on the lower culms will be removed to accentuate this peculiarity. 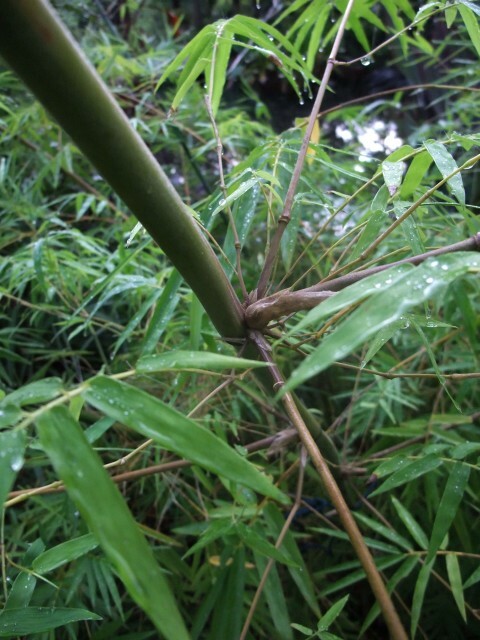 New shoots may revert into normal shaped culms. ■ Easy growing, moisture-retentive soil, full sun or light shade. ■ Solitary or group. Branches and foliage can be trimmed. Culms used for craft. ► [182, 387] (BS) (BW)! ■ Height 10-12(15?) m; culm diameter 5-7(9?) cm; dense clumper; habit erect, bending over, branches thin, numerous and short. 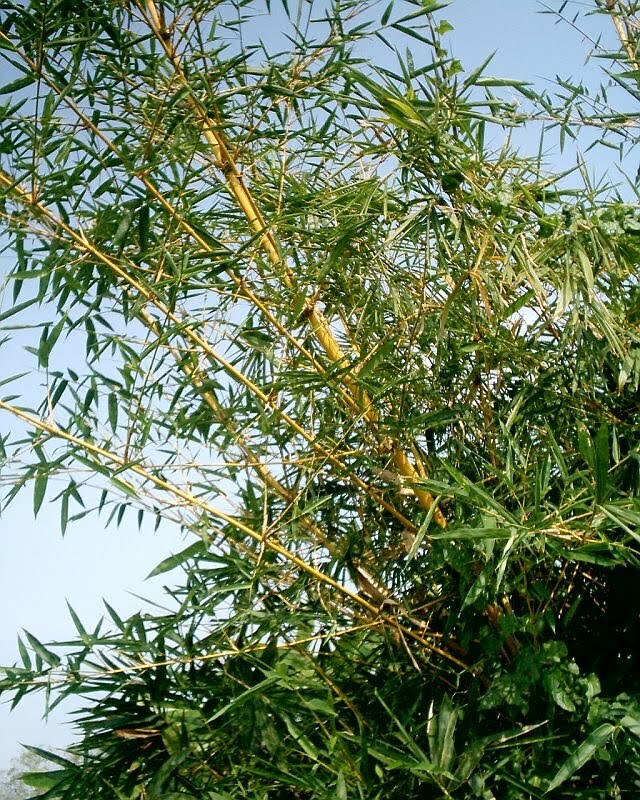 ■ A bamboo with attractive habit and medium-sized foliage leaves, can grow tall under favorable conditions. Native of Thailand. Also known as Cephalostachyum virgatum. ■ Solitary or group, best in the light understorey of tall trees. Culms used for light-weight construction and split work. ►  (BS1) (BS2) (BS3) (BW)! 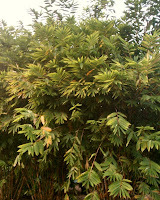 ■ Height 15 m; culm diameter 15-20 cm; dense clumper; habit erect, bending, large leaves. ■ A tall bamboo, stems densely covered with velvety brown hairs. Shoots thicker than 20 cm, emerge black. ■ Shoots delicious, widely planted for shoot production. Culms for construction and craft. ■ Height 10-12(20?) m; culm diameter 10(15?) cm; dense clumper; habit erect, bending, medium-sized leaves. 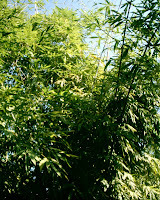 ■ A tall bamboo, culms and foliage in dark green appearance. Shoots emerge green. ■ Easy growing, moisture-retentive soil, full sun, withstands some drought. ■ Height 15-18 m; culm diameter 10-15 cm; clumper; habit erect. ■ Planted in northern Thailand. ■ Easy growing, moist or moisture-retentive soil, full sun. ■ For shoots and construction. ■ Height 19-33 m; culm dia­meter 13-20 cm; culms erect, clumper. 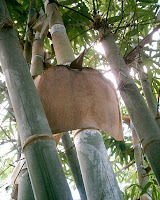 ■ Culm sheaths covered with pale white hairs. ■ Easy growing, moist or moisture-retentive soil. ■ Height over 15 m; culm diameter 7 cm; dense clumper; habit erect, slightly bending, medium to large leaves. ■ Prefers moist soil, not drought tolerant; best to keep in light shade when young. ■ Shoots for diet, culms for construction, plants for landscaping. ■ Height 20-30 m; culm diameter 20-30 cm; clumper. ■ A native of Burma and Thailand (in northern and western Thailand wild in the borderland to Burma). 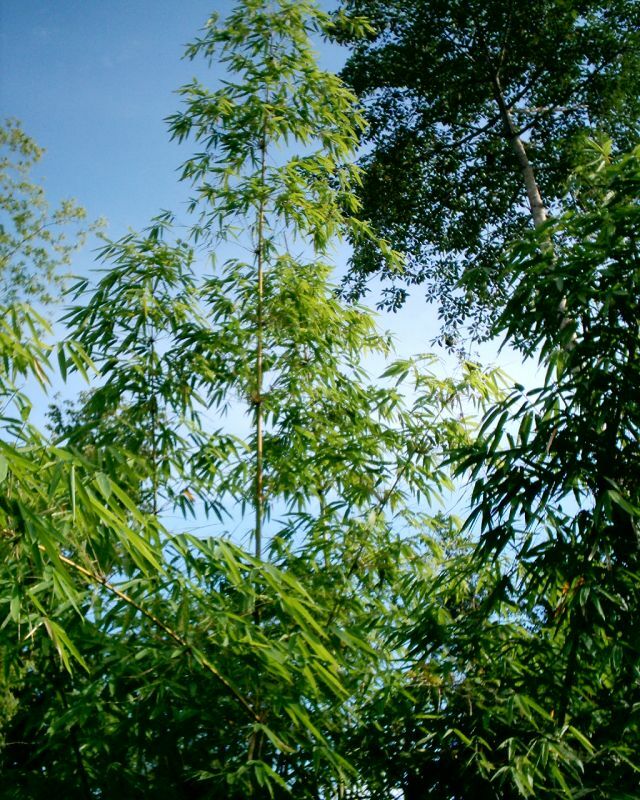 ■ Culms mainly for construction and building purposes, shoots for diet. ■ Height 12-23 m; culm diameter 9-18 cm; culms erect, clumper. ■ Widely distributed in northern India, southern China, Burma and Thailand. 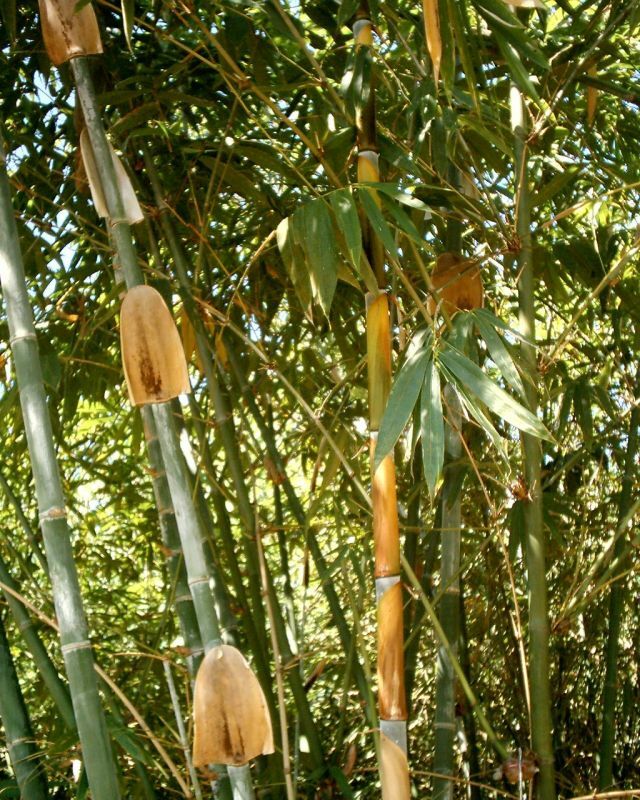 ■ Culms mainly used for construction and building purposes, also for basketry, shoots for diet. ■ Height 18-26 m; culm diameter 10-24 cm; clumper; habit erect, slightly bending, lower culm branchless. 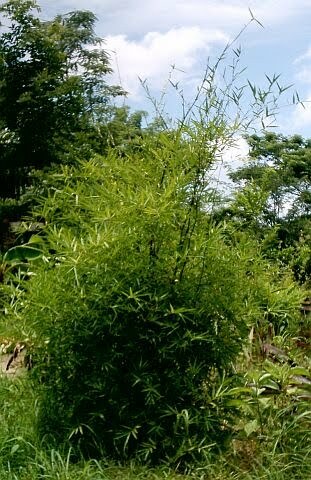 ■ A tall, very attractive bamboo with large leaves, introduced into Thailand from Taiwan for shoot production. ■ Easy and fast growing, moist soil, full sun. ■ Shoots delicious, commonly planted for shoot production, but has ornamental value, too. Culms for construction. ► [170, 270] (BS1) (BS2) (BS3) (BW)! 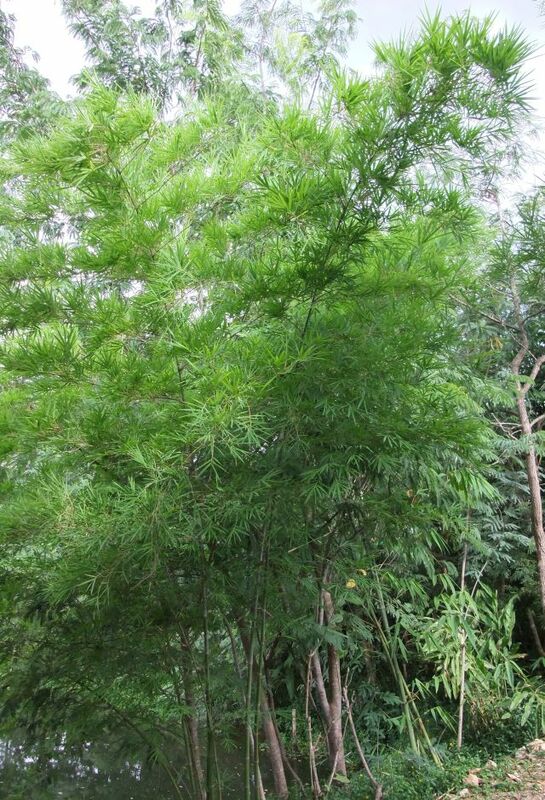 ■ Height 15-20 m; culm diameter 10-12 cm; clumper; habit erect, slightly bending, lower culm branchless. 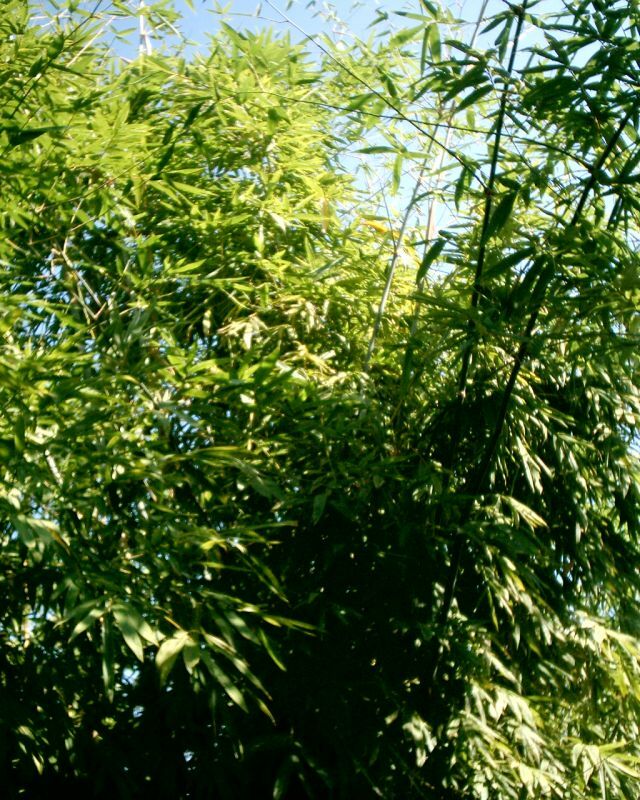 ■ A tall, attractive bamboo with small leaves. ■ Shoots for diet, culms for construction, plants for land­scaping. ■ Height up to 25 m; culm diameter up to 12 cm. ■ "Rachini" is said to be a tall and big growing selection. ■ Commonly planted for scaffolding, furniture-making, chopsticks, toothpicks, fruit-picks, but has ornamental value, too. 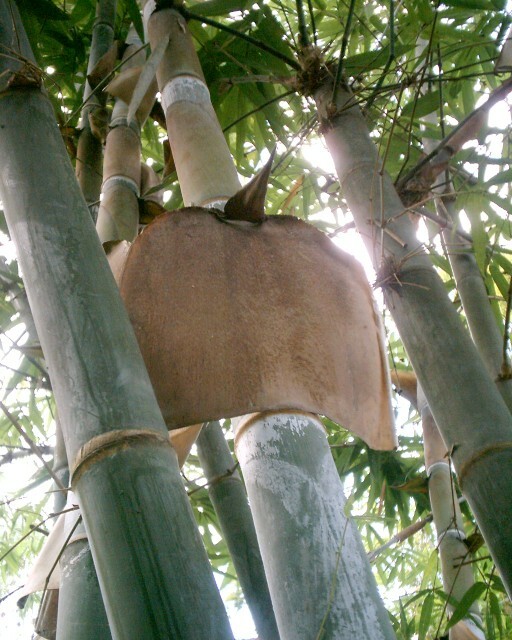 ■ Height >15 m; culm diameter 10 cm; clumper; habit erect and upright, slightly bending above. 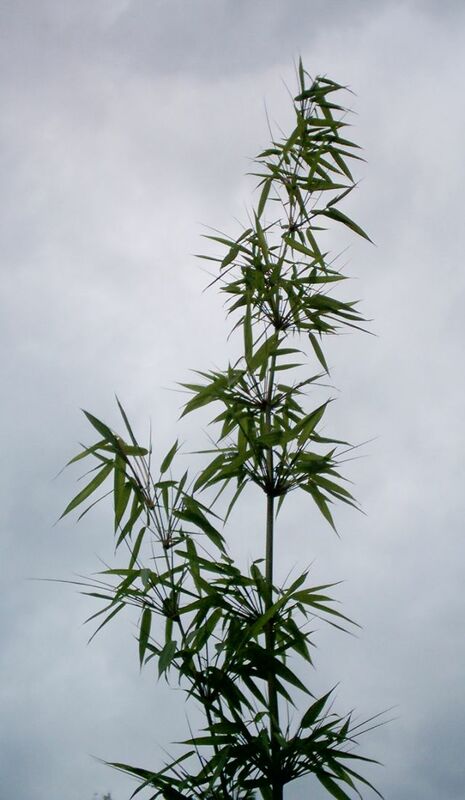 ■ A tall bamboo, dark green culms and foliage. Culms thick-walled, lower culms solid or nearly so. ■ Easy growing, moisture-retentive soil, full sun, perhaps somewhat drought-resistant. 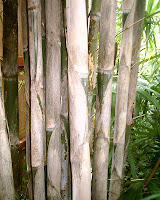 ■ Culms for house construction and furniture, mainly planted in Thailand for producing chop-sticks and tooth-picks. Plant has ornamental value, suitable for tall screen. ■ Identification not yet verified. 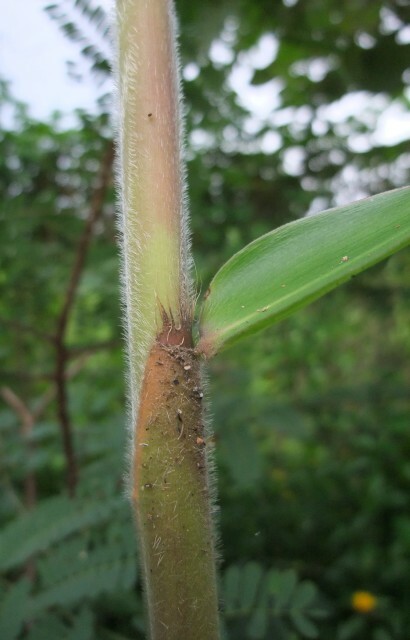 It is certainly a Dendrocalamus species, but not D. sericeus. ► [190, 217, 228, 264] (BS1)! ■ Height 23-32 m; culm diameter 16-30 cm; clumper. ■ From southern China. 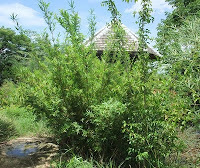 Wild or planted in northern Thailand. ■ For construction, beams and pillars, plywood, paper-making; plants for landscaping. ■ Height 10-12 m; culm diameter 5-8 cm; clumper; habit upright, slightly bending, branching from base up. 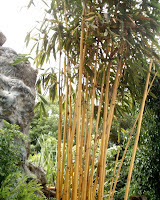 ■ A medium-sized bamboo, dark green culms and foliage. Culms and branches solid or nearly so. ■ Easy growing, moisture-retentive soil, full sun, fairly drought-resistant. 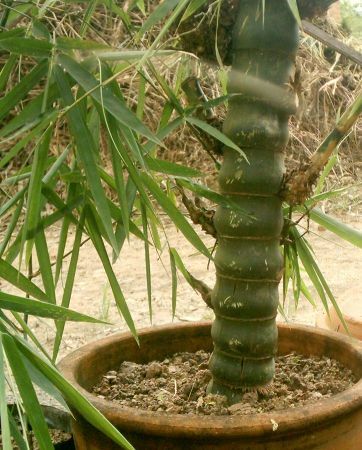 ■ Mainly planted in Thailand for its culms to be used for any type of construction or household and garden tools. ► [171, 213] (IN) (BS) (BW)! 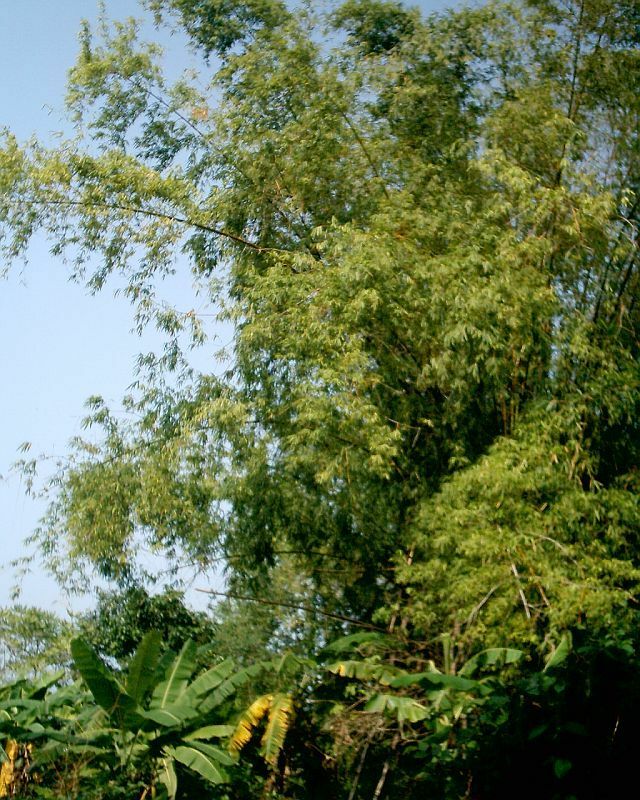 ■ Height 8-12 m; culm diameter 2 cm; dense clumper; habit winding up trees. 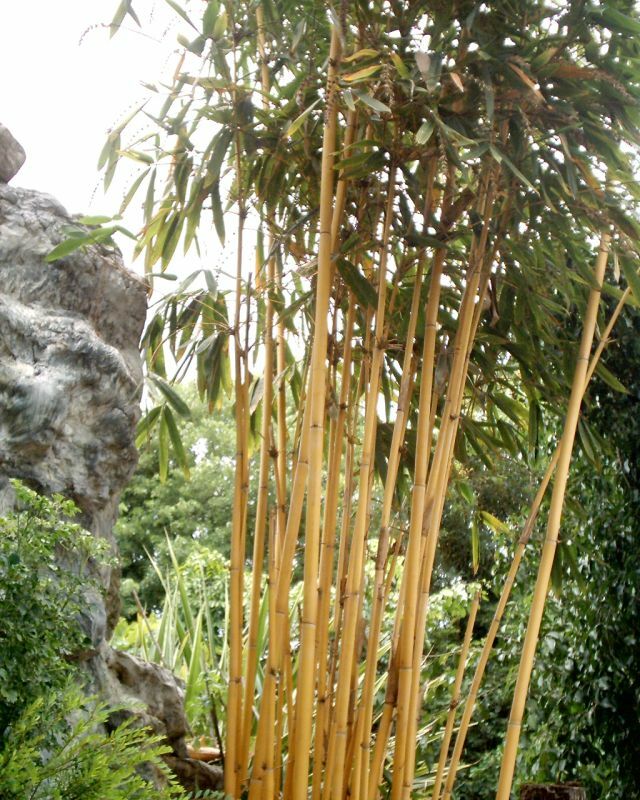 ■ An unusual, climbing bamboo from the wild. ■ Easy growing, moist soil, light or deep shade. 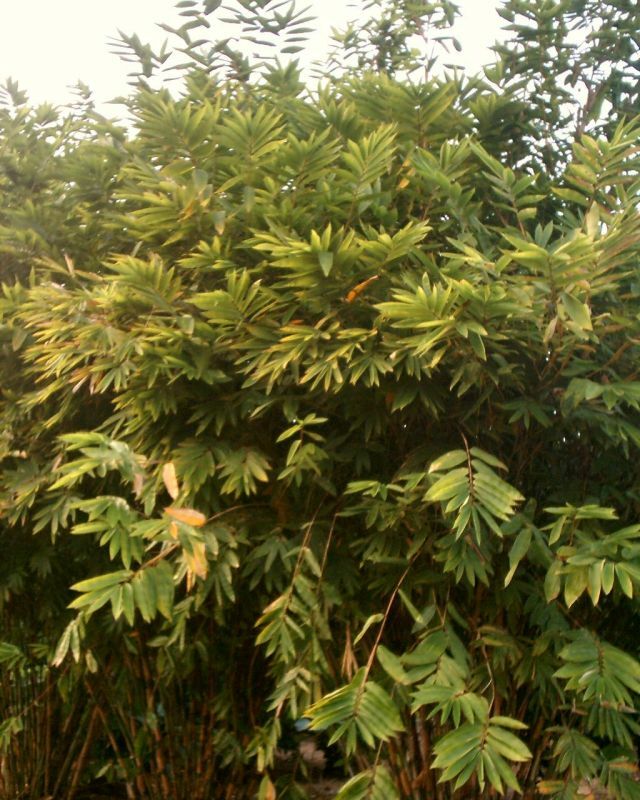 ■ A good plant to add a wild-tropical ornamental feature to a garden with tall trees. ■ Height 7-10 m; culm dia­meter 1.5-5 cm; clumper. ■ Widely cultivated in Southeast Asia. ■ Shoots for diet, culms for light construction, furniture-making, and farm tools. ■ Height 10 m; culm diameter 4 cm; runner; habit erect, slightly bending, grove-forming. 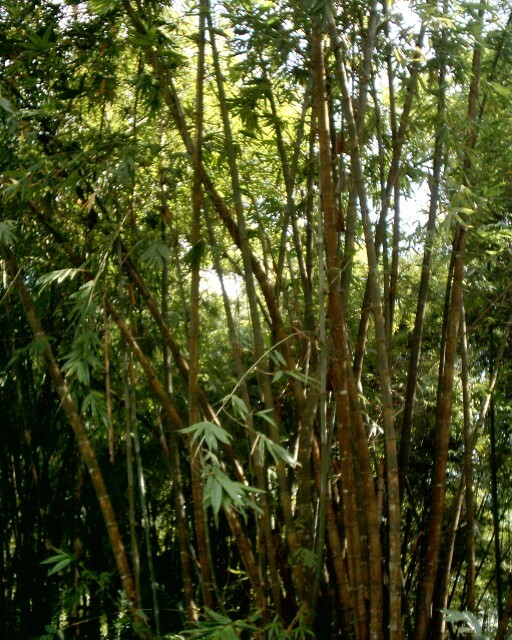 ■ An outstanding ornamental grove bamboo for warm-temperate zones, or higher altitudes in Thailand. Stems becoming black with maturity. ■ For open-spaced grove and visual screen. Can be kept as a container plant for some time. ■ Height 8? m; culm diameter 4? cm; runner; habit erect, slightly bending, grove-forming. ■ An ornamental grove bamboo for warm-temperate zones, or higher altitudes in Thailand. Stems orange-yellow. ■ Species identification not yet verified. ■ Height 10-12 m, culm diameter 5-8 cm; clumper; habit upright, lower part almost branchless, branches short. ■ A highly appreciated ornamental, widely planted. 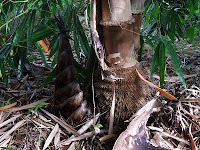 Three varieties of Schizostachyum brachycladum can be distinguished: The green stem wild form, ไผ่โป (phai po), the green stem yellow striped variety, 'Ratchaphruek', and the yellow stem green striped variety, 'Bali Kuning'. In 'Bali Kuning', which is also known as Bali Golden Sacred and Sacred Bali Bamboo, usually the green stripes are few, very thin, and occur randomly, especially in old clumps. Foliage leaves from both cultivars occasionally and randomly show narrow yellow stripes. ■ Solitary ornamental. Culms for craft and split-work. ► [191A, 208, 425] (BS1) (BS2) (BW)! 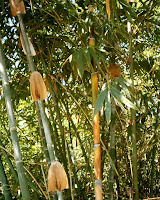 ■ Height up to 25 m; culm diameter 5-8 cm; very dense clumper; habit upright, slightly bending above, no low branching. ■ A common bamboo in Thailand, wild and often planted. 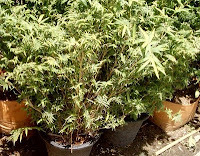 ■ Easy growing, moisture-retentive soil, somewhat drought-resistant, full sun, tolerates some shade. ■ For tall-narrow visual screen, hedge and windbreak, ornamental solitary or group. Shoots for diet. Culms for light-weight construction and craft. ■ Height 10-12 m; culm diameter 5-7 cm; very dense clumper; habit upright, slightly bending above, no low branching. 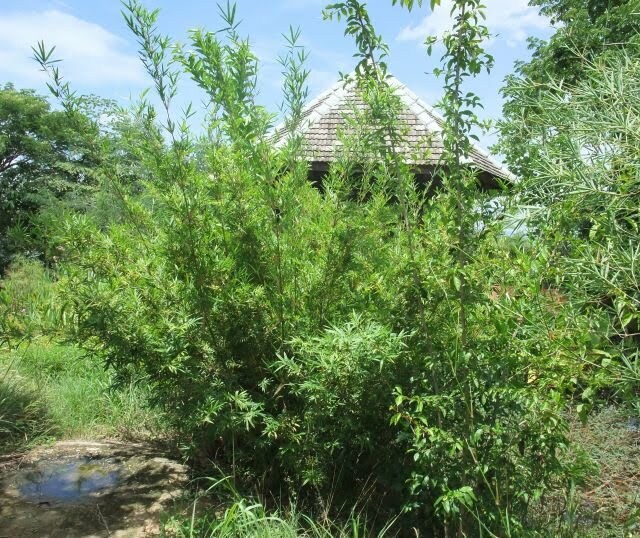 ■ Widespread in Thailand, wild and often planted. ■ For narrow visual screen and hedge, ornamental solitary or group. Shoots for diet. Culms for tools. 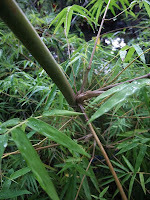 This column contains the most important links to bamboo related information that Baan Sammi offers. — Diese Webseite enthält die wichtigsten Links zu Bambus-Informationen, die Baan Sammi anbietet. to get notifications by email! On every webpage of BAAN SAMMI that is a blog, you will find, as the last gadget on this column, the GoogleTranslate gad­get. On this gadget, please select the language into which the text of the blog should be translated.